" As Promised, On Schedule "
ATLANTA – Nearing a milestone in the long and divisive Iraq war, President Barack Obama on Monday hailed this month's planned withdrawal of all U.S. combat troops — "as promised and on schedule" — as a major success despite deep doubts about the Iraqis' ability to police and govern their country. 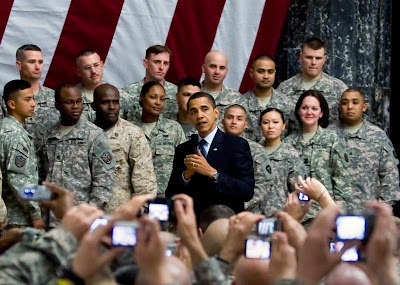 Portraying the end of America's combat role in the 7-year war as a personal promise kept, Obama said Iraq will have 90,000 fewer U.S. troops by September than when he took office — a steady homeward flow he called "a season of homecomings." But there could still be more fighting involving U.S. forces. "The hard truth is we have not seen the end of American sacrifice in Iraq," the president said in a speech to the national convention of the Disabled American Veterans. "But make no mistake, our commitment in Iraq is changing — from a military effort led by our troops to a civilian effort led by our diplomats." A transitional force of 50,000 troops will remain, down from the peak of 160,000 in 2007. Their mission will be to train and advise Iraqi security forces, protect U.S. civilians, manage the chain of supplies and equipment out of Iraq and conduct counterterrorism operations. Those soldiers and Marines will remain in harm's way and will be likely to engage at times in some form of fighting. Iraqi commanders will be able to ask the U.S. for front-line help. All American troops are to leave Iraq by the end of next year, as mandated under an agreement negotiated before Obama took office, between the Iraqis and President George W. Bush. Obama's speech Monday was the first of many, with appearances planned throughout the month by the president, Vice President Joe Biden and other administration officials. The schedule reflects a White House eager, with pivotal congressional elections approaching, for achievements to tout, especially in areas with the emotional significance of the Iraq war. Obama's campaign pledge to oversee a speedy conclusion to the U.S. fighting was the promise that most defined his presidential campaign, and it brought him significant support. Labels: President: U.S. to Leave Iraq "As Promised-On Schedule"